Have you ever had a moment where you thought, “I can’t believe I did that.” We can probably all relate to that feeling of surprise. Imagine, however, that you feel completely disconnected from your body and your emotions. You see yourself almost from outside, as if you are watching somebody else act. Imagine feeling like your hands and legs don’t belong to your body, or that your voice doesn’t sound like your voice. Imagine that you feel numb inside, or like you can’t relate to your own emotional responses. This is state of someone who suffers from depersonalization disorder. Most of us would have difficulty relating to this sense of disconnect, this loss of self. Thankfully Daphne Simeon and Jeffrey Abugel have written a very informative book to help readers explore this disorder. Feeling Unreal is helpful because it offers helpful explanations of the disorder with restrained discussions of the more debated aspects of it. Despite being one of the more common mental health issues, and having over 100 years of documentation in literature, still little is understood about the disorder by the average person, even the average mental health worker. Feeling Unreal stands as the first “definitive work” on the subject (3). Published in 2006, it remains a standard text in understanding the disorder. The book’s nine chapters explore the subject across several realms. Chapters 1 and 2 give description to the experience and the various symptoms of disorder. Daphne Simeon is an expert in depersonalization and she borrows heavily from her patience over the years to give readers insight into the details of depersonalization. Chapter 2 examines and summarizes the major contributions of past research on the subject. The authors explore the various theories that arose to the surface, and capture the various emphases that dominated the conversation over depersonalization – whether sensory distortion, altered sense of time, obsession, or sense of the self. Chapters 4, 5, and 6 turn attention to the more clinical side of the issue. Readers are introduced to the history of and the tools used in diagnosis. They are offered insight into the clinical research more recently being conducted on the subject, and then granted a guided tour through the brain and the related biological issues of depersonalization. Chapter 9 is an intriguing and unique look at the subject through the lens of literature and philosophy. Abugel shows his skill here in analyzing the subject and synthesizing the discussion. Finally, chapters 8 and 9 approach the subject of treatment, looking at both medication and psychotherapy. The book is an incredibly insightful articulation of the disorder. 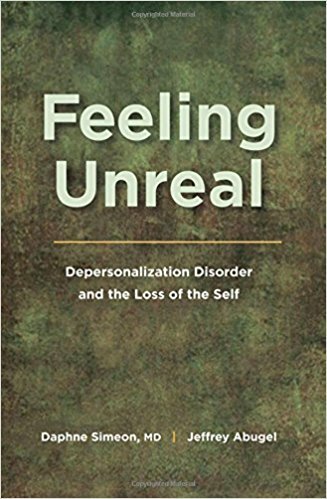 Readers are given tremendous help in understanding the common experience of depersonalization, as well as derealization. Through both their own explanations and the use of descriptions from actual sufferers of the disorder readers are given clarity.These kinds of works allow us all to better understand the lived experience of those who suffer, and allow us then to interact with their own pain, confusion, and discomfort. Biblical Counselors in particular will benefit from the descriptions and insights afforded to them through this monograph. Yet, the authors also demonstrate some great restrain when it comes to talking about causation, origination, and treatment. They acknowledge the limitations of the current literature and research. They do not know exactly what causes the disorder, why it responds to a variety of triggers, what correlation it has to actual brain chemistry, and how to best treat it. They regularly offer input and speculation, but they are careful not to overstate their case. They note that there is no specific pharmacology that has proven effective in treatment. They authors do not a number of things that Biblical Counselors can gladly support: (1) the individual’s control over symptoms; (2) the significance of taking thoughts captive (though they authors don’t use this language); and (3) the value of journaling for understanding their experience and identifying patterns (a staple of Biblical Counseling homework). The book is not, of course, written from a Christian perspective and there are elements within it that do not coalesce with our worldview. Nonetheless, this is a valuable tool for description, with some helpful suggestions for prescription and treatment. Biblical Counselors currently struggling to understand this disorder and the ways in which they can be helpful to those who suffer will find a good introduction within Feeling Unreal. Proverbs 18:13 warns us, “If one gives an answer before he hears, it is his folly and shame.” Biblical Counselors working with sufferers of depersonalization will do well to read this book, then, as a means to better understanding.